The dentate gyrus is part of a brain region known as the hippocampus (part of the hippocampal formation). The dentate gyrus is thought to contribute to the formation of new episodic memories, the spontaneous exploration of novel environments, and other functions. It is notable as being one of a select few brain structures currently known to have significant rates of adult neurogenesis in many species of mammals, from rodents to primates  (other sites include the subventricular zone of the striatum and cerebellum). However, whether neurogenesis exists in the adult human dentate gyrus is currently a matter of debate. 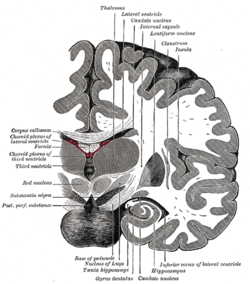 Diagram of hippocampal regions. DG: Dentate gyrus. The dentate gyrus (DG) consists of three distinct layers: molecular, granular, and polymorphic, and participates in the 'hippocampal circuit' or trisynaptic loop. The neurons of the granule cell layer are called granule cells project axons called mossy fibers to make excitatory synapses on the dendrites of CA3 pyramidal neurons. A second excitatory cell type in the DG, the mossy cell, projects its axons widely along the septotemporal axis, with the ipsilateral projection skipping the first 1–2 mm near the cell bodies, an unusual configuration, hypothesized to prepare a set of cell assemblies in CA3 for a data retrieval role, by randomizing their cell distribution. Granule cells of the DG receive excitatory input from the entorhinal cortex by way of the perforant pathway. This input is primarily made up of signals from layer II of the entorhinal cortex, and the dentate gyrus receives no direct inputs from other cortical structures. The perforant pathway is divided into the medial and lateral perforant paths, generated, respectively, at the medial and lateral portions of the entorhinal cortex. The medial perforant path synapses onto the proximal dendritic area of the granule cells, whereas the lateral perforant path does so onto their distal dendrites. Most lateral views of the dentate gyrus may appear to suggest a structure consisting of just one entity, but medial movement may provide evidence of the ventral and dorsal parts of the dentate gyrus. The granule cells in the dentate gyrus are distinguished by their late time of formation during brain development. In rats, approximately 85% of the granule cells are generated after birth. In humans, it is estimated that granule cells begin to be generated during gestation weeks 10.5 to 11, and continue being generated during the second and third trimesters, after birth and all the way into adulthood. The germinal sources of granule cells and their migration pathways  have been studied during rat brain development. The oldest granule cells are generated in a specific region of the hippocampal neuroepithelium and migrate into the primordial dentate gyrus around embryonic days (E) 17/18, and then settle as the outermost cells in the forming granular layer. Next, dentate precursor cells move out of this same area of the hippocampal neuroepithelium and, retaining their mitotic capacity, invade the hilus (core) of the forming dentate gyrus. This dispersed germinal matrix is the source of granule cells from that point on. The newly generated granule cells accumulate under the older cells that began to settle in the granular layer. As more granule cells are produced, the layer thickens and the cells are stacked up according to age - the oldest being the most superficial and the youngest being deeper. The granule cell precursors remain in a subgranular zone that becomes progressively thinner as the dentate gyrus grows, but these precursor cells are retained in adult rats. These sparsely scattered cells constantly generate granule cell neurons, which add to the total population. There are a variety of other differences in the rat, monkey and human dentate gyrus. The granule cells only have apical dendrites in the rat. But in the monkey and human, many granule cells also have basal dendrites. Phenotypes of proliferating cells in the dentate gyrus. A fragment of an illustration from Faiz et al., 2005. The dentate gyrus is thought to contribute to the formation of memories, and to play a role in depression. The role of the hippocampus in learning and memory has been studied for many decades since early lesion studies. One of the most prominent early cases of anterograde amnesia (inability to form new memories) linking the hippocampus to memory formation was the case of Henry Molaison (anonymously known as Patient H.M. until his death in 2008). His epilepsy was treated with surgical removal of his hippocampi (left and right hemispheres each have their own hippocampus) as well as some surrounding tissue. This targeted brain tissue removal left Mr. Molaison with an inability to form new memories, and the hippocampus has been thought critical to memory formation since that time. It remains unclear how the hippocampus enables new memory formation, but one process, called long term potentiation (LTP), occurs in this brain region. LTP involves long-lasting strengthening of synaptic connections after repeated stimulation. While the dentate gyrus shows LTP, it is also one of the few regions of the adult mammalian brain where neurogenesis (i.e., the birth of new neurons) takes place. Some studies hypothesize that new memories could preferentially use newly formed dentate gyrus cells, providing a potential mechanism for distinguishing multiple instances of similar events or multiple visits to the same location. This increased neurogenesis is associated with improved spatial memory in rodents, as seen through performance in a maze. The dentate gyrus may also have a functional role in stress and depression. For instance, neurogenesis has been found to increase in response to chronic treatment with antidepressants. The physiological effects of stress, often characterized by release of glucocorticoids such as cortisol, as well as activation of the sympathetic division of the autonomic nervous system, have been shown to inhibit the process of neurogenesis in primates. Both endogenous and exogenous glucocorticoids are known to cause psychosis and depression, implying that neurogenesis in the dentate gyrus may play an important role in modulating symptoms of stress and depression. Some evidence suggests neurogenesis in the dentate gyrus increases in response to aerobic exercise. Several experiments have shown neurogenesis (the development of nerve tissues) often increases in the dentate gyrus of adult rodents when they are exposed to an enriched environment. The dentate gyrus is also known to serve as a pre-processing unit. When information enters, it is known to separate very similar information into distinct and unique details. This prepares the relevant data for storage in the hippocampal CA3 section. Studies have shown that after destroying about 90% of their dentate gyrus (dg) cells, rats had extreme difficulty in maneuvering through a maze they had been through, prior to the lesion being made. When being tested a number of times to see whether they could learn a maze, the results showed that the rats did not improve at all, indicating that their working memories were severely impaired. Rats had trouble with place strategies because they could not consolidate learned information about a maze into their working memory, and, thus, could not remember it when maneuvering through the same maze in a later trial. Every time a rat entered the maze, the rat behaved as if it was seeing the maze for the first time. Studies by researchers at Columbia University Medical Center indicate poor glucose control can lead to deleterious effects on the dentate gyrus. ^ a b Amaral DG, Scharfman HE, Lavenex P (2007). "The dentate gyrus: fundamental neuroanatomical organization (dentate gyrus for dummies)". Progress in Brain Research. 163: 3–22. doi:10.1016/S0079-6123(07)63001-5. ISBN 9780444530158. PMC 2492885. PMID 17765709. ^ a b Saab BJ, Georgiou J, Nath A, Lee FJ, Wang M, Michalon A, Liu F, Mansuy IM, Roder JC (2009). "NCS-1 in the dentate gyrus promotes exploration, synaptic plasticity, and rapid acquisition of spatial memory". Neuron. 63 (5): 643–56. doi:10.1016/j.neuron.2009.08.014. PMID 19755107. ^ Helen Scharfman, ed. (2007). "The Dentate Gyrus: A comprehensive guide to structure, function, and clinical implications". Progress in Brain Research. 163: 1–840. ^ Cameron HA, McKay RD (July 2001). "Adult neurogenesis produces a large pool of new granule cells in the dentate gyrus". J. Comp. Neurol. 435 (4): 406–17. doi:10.1002/cne.1040. PMID 11406822. ^ Ernst, A; Alkass, K; Bernard, S; Salehpour, M; Perl, S; Tisdale, J; Possnert, G; Druid, H; Frisén, J (27 February 2014). "Neurogenesis in the striatum of the adult human brain". Cell. 156 (5): 1072–83. doi:10.1016/j.cell.2014.01.044. PMID 24561062. ^ Ponti G, Peretto P, Bonfanti L (2008). "Genesis of neuronal and glial progenitors in the cerebellar cortex of peripuberal and adult rabbits". PLoS ONE. 3 (6): e2366. Bibcode:2008PLoSO...3.2366P. doi:10.1371/journal.pone.0002366. PMC 2396292. PMID 18523645. ^ Sorrells SF, Paredes MF, Cebrian-Silla A, Sandoval K, Qi D, Kelley KW, et al. (March 2018). "Human hippocampal neurogenesis drops sharply in children to undetectable levels in adults". Nature. 555 (7696): 377–381. Bibcode:2018Natur.555..377S. doi:10.1038/nature25975. PMC 6179355. PMID 29513649. ^ Boldrini M, Fulmore CA, Tartt AN, Simeon LR, Pavlova I, Poposka V, et al. (April 2018). "Human Hippocampal Neurogenesis Persists throughout Aging". Cell Stem Cell. 22 (4): 589–599.e5. doi:10.1016/j.stem.2018.03.015. PMC 5957089. PMID 29625071. ^ A. Treves; A. Tashiro; M.P. Witter; E.I. Moser (2008). What is the mammalian dentate gyrus good for? (154th ed.). pp. 1155–1172. ^ Legéndy, C. R. (April 2017) "On the 'data stirring' role of the dentate gyrus of the hippocampus". Reviews in the Neurosciences 28 (6): 599-615. DOI: 10.1515/revneuro-2016-0080. ^ a b Blumenfeld, Hal (2010). Neuroanatomy through clinical cases (2nd ed.). Sunderland, Mass. : Sinauer Associates. ISBN 978-0878936137. ^ Nolte, John (2002). The Human Brain: An Introduction to Its Functional Neuroanatomy (fifth ed.). pp. 570–573. ^ Rachel A. Dalley; Lydia L. Ng; Angela L. Guillozet-Bongaarts (2008). "Dentate Gyrus". Nature Precedings. doi:10.1038/npre.2008.2095.1. ^ Bayer SA, Altman J (November 1974). "Hippocampal development in the rat: cytogenesis and morphogenesis examined with autoradiography and low-level X-irradiation". J. Comp. Neurol. 158 (1): 55–79. doi:10.1002/cne.901580105. PMID 4430737. ^ Bayer SA, Altman J (2008). The Human Brain During The Early First Trimester. 5 Atlas of Human Central Nervous System Development. Appendix, p. 497. ^ Eriksson PS, Perfilieva E, Björk-Eriksson T, et al. (November 1998). "Neurogenesis in the adult human hippocampus". Nat. Med. 4 (11): 1313–7. doi:10.1038/3305. PMID 9809557. ^ Altman J, Bayer SA (November 1990). "Migration and distribution of two populations of hippocampal granule cell precursors during the perinatal and postnatal periods". J. Comp. Neurol. 301 (3): 365–81. doi:10.1002/cne.903010304. PMID 2262596. ^ Altman J, Bayer SA (November 1990). "Mosaic organization of the hippocampal neuroepithelium and the multiple germinal sources of dentate granule cells". J. Comp. Neurol. 301 (3): 325–42. doi:10.1002/cne.903010302. PMID 2262594. ^ Angevine JB (October 1965). "Time of neuron origin in the hippocampal region. An autoradiographic study in the mouse". Exp Neurol Suppl (Suppl 2): Suppl 2:1–70. PMID 5838955. ^ Bayer SA, Yackel JW, Puri PS (May 1982). "Neurons in the rat dentate gyrus granular layer substantially increase during juvenile and adult life". Science. 216 (4548): 890–2. Bibcode:1982Sci...216..890B. doi:10.1126/science.7079742. PMID 7079742. ^ Bayer SA (1982). "Changes in the total number of dentate granule cells in juvenile and adult rats: a correlated volumetric and 3H-thymidine autoradiographic study". Exp Brain Res. 46 (3): 315–23. doi:10.1007/bf00238626. PMID 7095040. ^ Faiz M, Acarin L, Castellano B, Gonzalez B (2005). "Proliferation dynamics of germinative zone cells in the intact and excitotoxically lesioned postnatal rat brain". BMC Neurosci. 6 (1): 26. doi:10.1186/1471-2202-6-26. PMC 1087489. PMID 15826306. ^ a b c Kandel ER, Schwartz J, Jessell T, Siegelbaum S, Hudspeth AJ (2013). Principles of neural science (5th ed.). McGraw Hill Professional. ISBN 978-0-07-139011-8. ^ Nakashiba T, Cushman JD, Pelkey KA, Renaudineau S, Buhl DL, McHugh TJ, et al. (March 2012). "Young dentate granule cells mediate pattern separation, whereas old granule cells facilitate pattern completion". Cell. 149 (1): 188–201. doi:10.1016/j.cell.2012.01.046. PMC 3319279. PMID 22365813. ^ Bliss RM (August 2007). ""Food and the Aging Mind". First in a Series: Nutrition and Brain Function". USDA. USDA.gov. Retrieved 27 February 2010. ^ Malberg JE, Eisch AJ, Nestler EJ, Duman RS (December 2000). "Chronic antidepressant treatment increases neurogenesis in adult rat hippocampus". J. Neurosci. 20 (24): 9104–10. PMID 11124987. ^ Gould E, Tanapat P, McEwen BS, Flügge G, Fuchs E (March 1998). "Proliferation of granule cell precursors in the dentate gyrus of adult monkeys is diminished by stress". Proc. Natl. Acad. Sci. U.S.A. 95 (6): 3168–71. Bibcode:1998PNAS...95.3168G. doi:10.1073/pnas.95.6.3168. PMC 19713. PMID 9501234. ^ Jacobs BL, van Praag H, Gage FH (May 2000). "Adult brain neurogenesis and psychiatry: a novel theory of depression". Mol. Psychiatry. 5 (3): 262–9. doi:10.1038/sj.mp.4000712. PMID 10889528. ^ Surget A, Tanti A, Leonardo ED, Laugeray A, Rainer Q, Touma C, Palme R, Griebel G, Ibarguen-Vargas Y, Hen R, Belzung C (December 2011). "Antidepressants recruit new neurons to improve stress response regulation". Mol. Psychiatry. 16 (12): 1177–88. doi:10.1038/mp.2011.48. PMC 3223314. PMID 21537331. ^ Praag, H (1999). "Running increases cell proliferation and neurogenesis in the adult mouse dentate gyrus". Nature Neuroscience. 2 (3): 266–270. doi:10.1038/6368. PMID 10195220. ^ Kempermann G, Kuhn HG, Gage FH (April 1997). "More hippocampal neurons in adult mice living in an enriched environment". Nature. 386 (6624): 493–5. Bibcode:1997Natur.386..493K. doi:10.1038/386493a0. PMID 9087407. ^ Eadie BD, Redila VA, Christie BR (May 2005). "Voluntary exercise alters the cytoarchitecture of the adult dentate gyrus by increasing cellular proliferation, dendritic complexity, and spine density". J. Comp. Neurol. 486 (1): 39–47. doi:10.1002/cne.20493. PMID 15834963. ^ "Structure, function, and plasticity of hippocampal dentate gyrus microcircuits | Frontiers Research Topic". ^ Xavier GF, Costa VC (August 2009). "Dentate gyrus and spatial behaviour". Prog. Neuropsychopharmacol. Biol. Psychiatry. 33 (5): 762–73. doi:10.1016/j.pnpbp.2009.03.036. PMID 19375476. ^ "Blood Sugar Control Linked to Memory Decline, Study Says". Nytimes.com. 1 January 2009. Retrieved 13 March 2011. Wikimedia Commons has media related to Dentate gyrus.